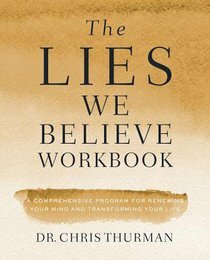 In this 25-lesson revised and updated workbook based on the classic bestseller, Dr. Chris Thurman reveals the lies we tell ourselves, how they damage us, and what we can do about them. Most of us were told growing up that it was wrong to lie to others. But how many of us were raised to believe that one of the biggest mistakes we can make in life is to lie to ourselves? Lies about ourselves: "I must be perfect," "My worth is determined by how I perform," "I must have everyone's approval," "It's easier to avoid my problems than face them…"
Lies about relationships: "People can meet my emotional needs," "I should be accepted just as I am," "Others are more messed up than me," "People have to earn my forgiveness…"
Lies about life: "I can have it all," "I shouldn't wait for what I want," "Being happy is the most important thing in life," "Life should be easy and fair…"
Lies about God: "I have to earn God's love," "God is mean and vindictive," "God ignores my disobedience," "God changes people," "God has lost control of everything…"
Lies men believe: "I don't have what it takes to be a man," "It's not okay to feel sad or scared," "My good intentions should satisfy everyone," "I can do it by myself…"
Lies women believe: "My job in life is to make everyone happy," "It's not okay to speak my mind," "I'm not worthy of being loved as I am," "Outer beauty is more important than inner beauty…"
Lies about reality: "I need to make a mountain out of a molehill," "I should take everything personally," "Life is black and white," "My feelings determine the truth…"
Truth matters-not just between us and others, but also inside of us. When we lie to ourselves, we poison our souls and lead an existence we wouldn't wish on our worst enemy. But when we tell ourselves the truth, we nourish our souls and fully experience the abundant life that Jesus wants us to have. The psalmist wrote, "Guide me in your truth and teach me, for you are God my Savior, and my hope is in you all day long" (Psalm 25:5). We live in a fallen world where "truth has stumbled in the streets" (Isaiah 59:14) and the majority of humankind is suffering because "their thinking became futile and their foolish hearts were darkened" (Romans 2:21). We desperately need to turn back to the Lord to guide us in his truth. We need to recognize the lies we believe ... and instead trust in the truth that God provides. About "The Lies We Believe: Winning the Battle For Your Mind (Workbook)"